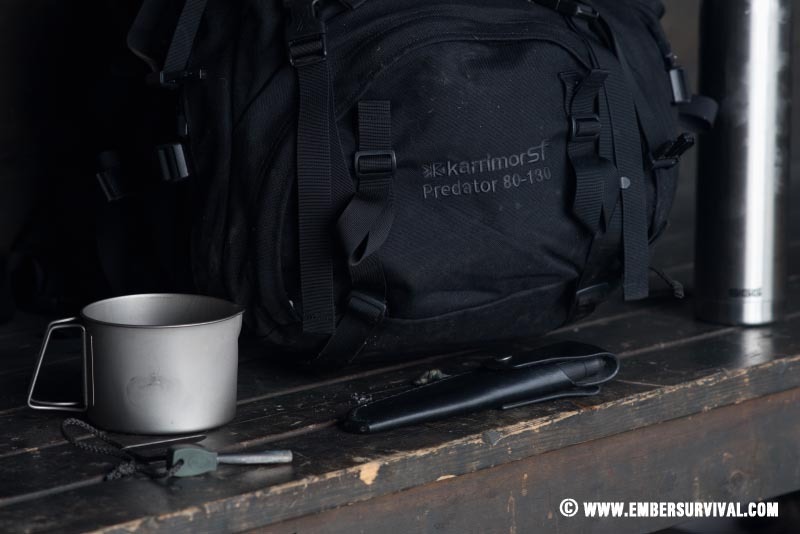 To review the Karrimor SF Predator 80 – 130, or indeed any rucksack, the most important feature to start with is the back system. How the harness is designed to fit and where the load is distributed through you is critical to success. A rucksack with loads of features is rendered useless if it doesn’t fit! 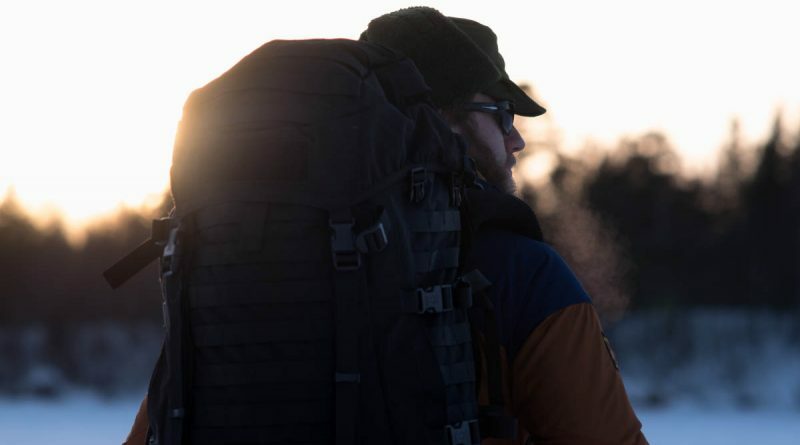 Karrimor SF Predator 80-130 is a large fully expandable rucksack that feels at home in the backcountry. 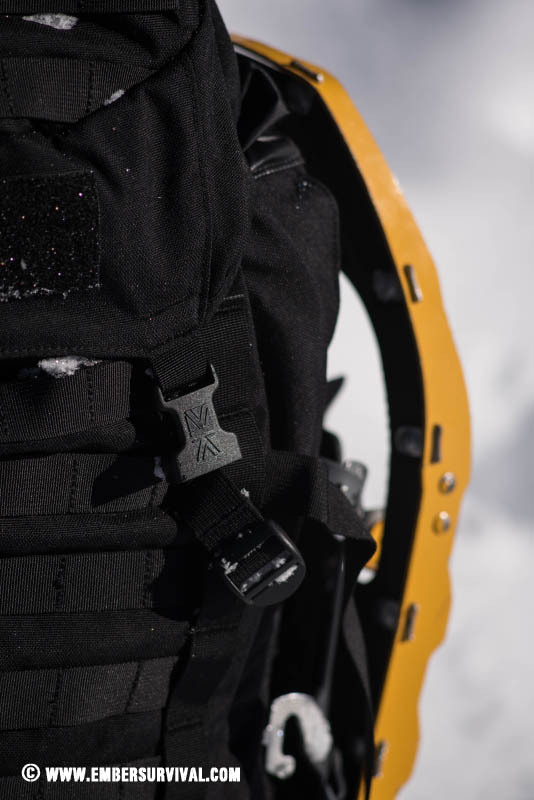 The SA back system on the Karrimor SF Predator 80 – 130 is fully adjustable and very easy to fit precisely. It’s a very simple design of two locking buckles which can be released to allow the shoulder and back sections to slide up or down. Once the desired fit is found the buckles can be pulled tight so the system stays in place. A great addition to this design is how the user can further adjust the back system even whilst wearing the rucksack. So if you notice a sore spot after a morning of hiking then the SA back system can be self adjusted to adapt to this developing situation and shift the load to another area. Karrimor SF Predator 80-130 on top of a fjell in Finnish Lapland. The straps and hip belt are all super thick and supportive with strong webbing around them. The hip belt features a great lumbar pad which is large and supportive; it bulges out from the rucksack so it sits very well against you. Having a proper lumbar pad and hip belt are essential for when the loads are heavy. The closure buckle on the hip belt is made from a strong feeling plastic, as is the sternum strap. To tighten the hip harness you pull the strap to your side. I tighten each side individually as it allows the user to get a tighter fit by using your triceps. It would be fantastic if Karrimor SF made the change to a front pull system as it is a lot easier to do than pulling to one’s side. Some vital equipment being used in a lean to shelter in Finnish Lapland. The Karrimor SF Predator 80 – 130 feels great on and fully loaded. Carrying 22kg feels acceptable due to the two aluminium stays that run parallel down the back of the pack. These provide stability and integrity to the user. Moreover the rucksack maintains its shape and form regardless of what you put in it. Having weight properly transferred through you in the correct area is vital for your body when hiking and the aluminium stays help push weight through your hips. This helps you walk further with less fatigue and it makes the Predator 80 – 130 a very comfortable rucksack. The Predator 80-130 can be altered in other ways too. When packing the rucksack you have the option of unzipping two large expansion baffles that run down the entire main section of the pack. These give you a little extra space that allows for accommodating wider items as well as giving you the ability to compress the main compartment when your supplies are running low and you no longer have the need for any additional space. It’s a great feature and I use it a lot. KarrimorSF Predator 80-130 has MOLLE covering pretty much the whole pack. This makes it great for adding kit or customising your loadout. 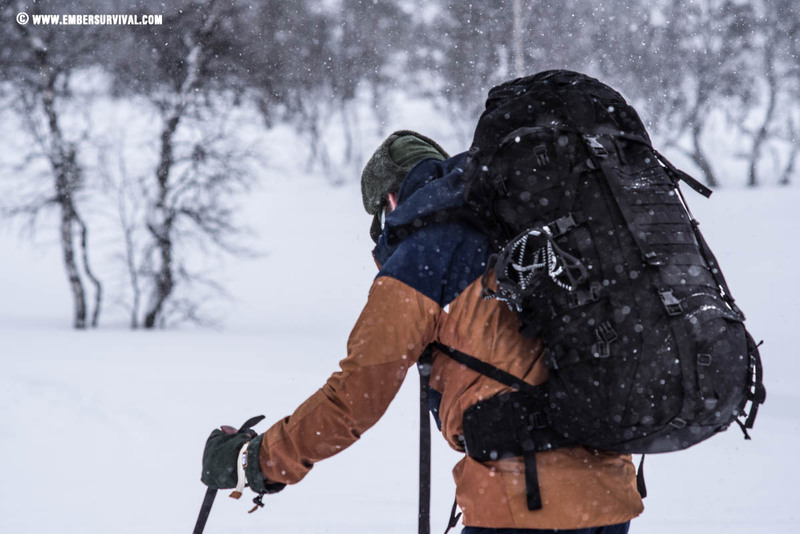 There are normal compression straps on the side of the rucksack which allow you to further control weight distribution as when you pull them tight the weight is drawn closer to you. Going one step further you can close the zips on the side of the rucksack to dramatically reduce the volume, say for example when going on a day hike from a basecamp. The Predator 80 – 130 can also be fitted with two PLCE side pouches. I have not needed this extra volume as fully expanded I find the rucksack big enough. I do see people fitting the pack with side pouches but I would say focus on your packing technique first before trying them as you might be alright with a bit of rethinking. The pack can be reduced in size by compressing the side straps. It makes a huge pack become a little easier to manage when not fully loaded. I normally stick my sleep system in the base of the rucksack along with a stove for quick access for mid hike brews. There is a division between the base compartment, with its zipped entrance, and the main compartment. You can toggle this using a drawcord. 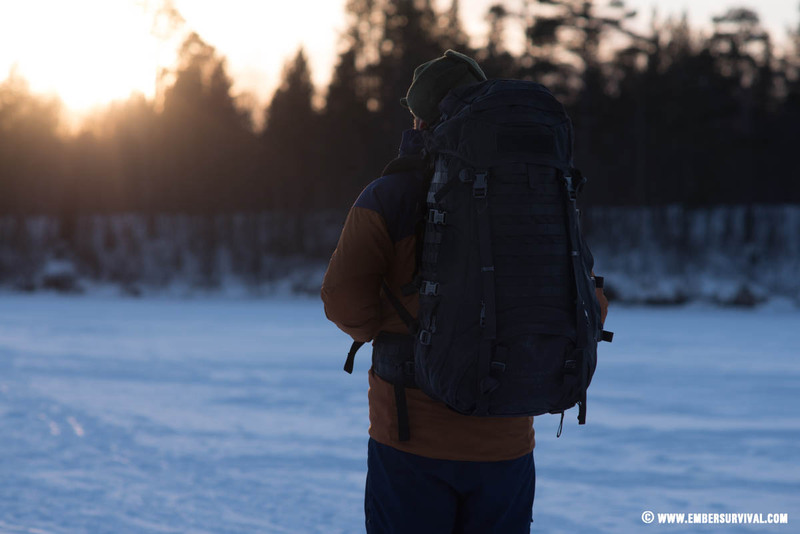 The rucksack is large and spacious with no difficulty fitting large winter sleep systems in whatsoever. The lid is not completely floating but it has a large baffle at the rear which can be loosened to allow the lid to be pulled over when you have lots in the pack. I always prefer floating lids but the Predator 80 – 130’s design is good enough. The lid has two pockets, one you can access from the outside and one on the inside. The lid is covered by MOLLE and has a patch to stick a Velcro badge if you want. MOLLE also continues down the face of the pack so your attachment options are vast. 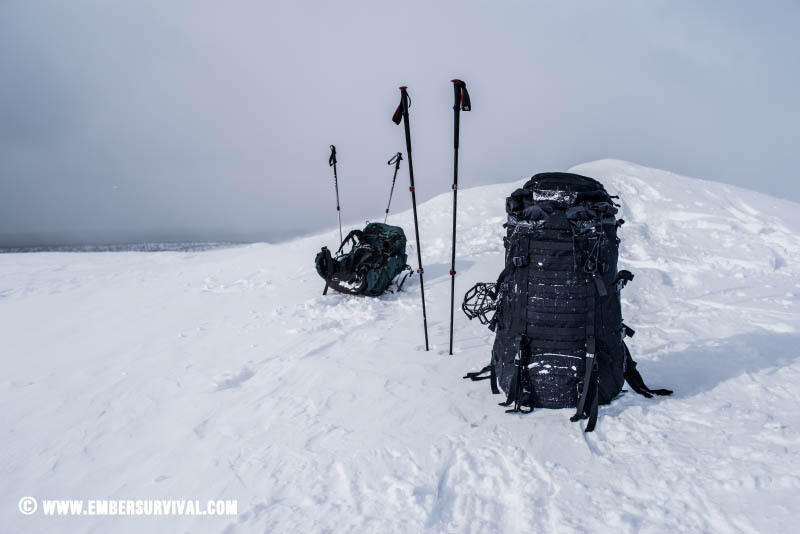 You can easily attach two poles and two snowshoes to the exterior of the pack. Down the sides there is a low profile pocket at the base which can hold hiking sticks or a pair of snowshoes, I find they fit perfectly here. Karrimor SF Predator 80-130 ontop of a fjell in Finnish Lapland. The compression straps at each side are very handy for quickly attaching equipment on the move as well as more permanent attachment points at the base of the pack where you could store a large expedition roll matt for long term use. The buckles are strong and built to last but they are not the lightest in design. This can also be said for the zips which are all strong and very sturdy. I am glad of this as the pack is made more dependable as a result. The overall weight of the Predator 80-130 is 3.8kg (3.6kg for the MultiCam). It uses 1000D Nylon which is very strong and abrasion resistant. 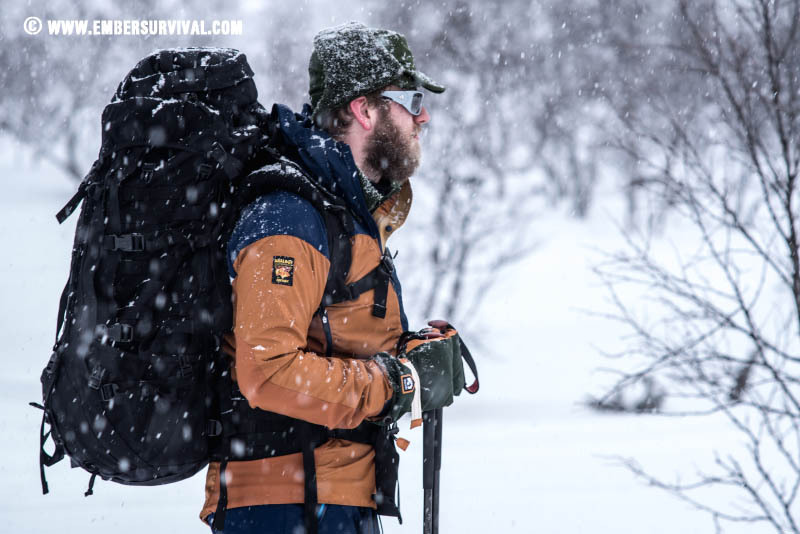 It’s a fabric that can handle a ton of abuse out in the field and if you are venturing out for longer backcountry trips then it’s certainly reasonable to expect this bomb proof fabric to serve you well. 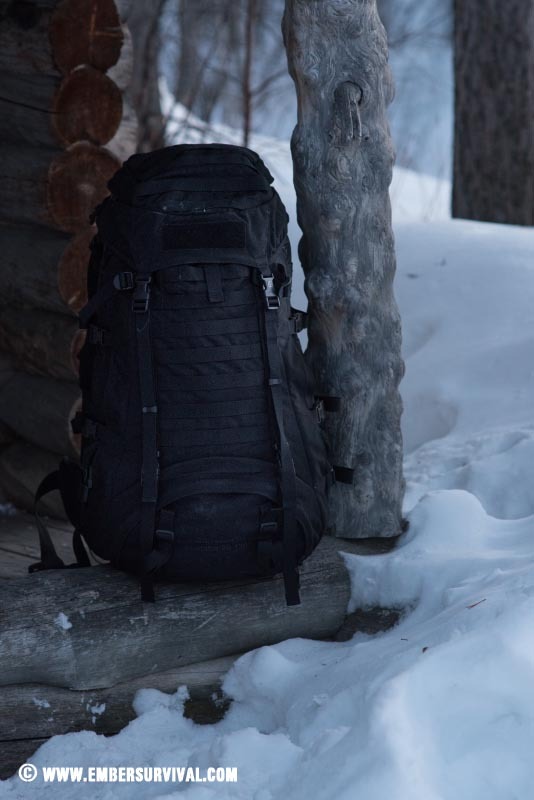 The rucksack has a very durable repellent finish that prevents snow build up. The fabric is also treated with a DWR of fluoro carbon. One of the strongest and longest lasting repellent finishes available. It does come at a price as it’s a very damaging chemical to nature and health. I always leave rucksacks treated with this out to air for a couple of days before use when I buy them new. Performance of this coating is exceptional, with snow, rain and mud all falling off the fabric without adhering to it. 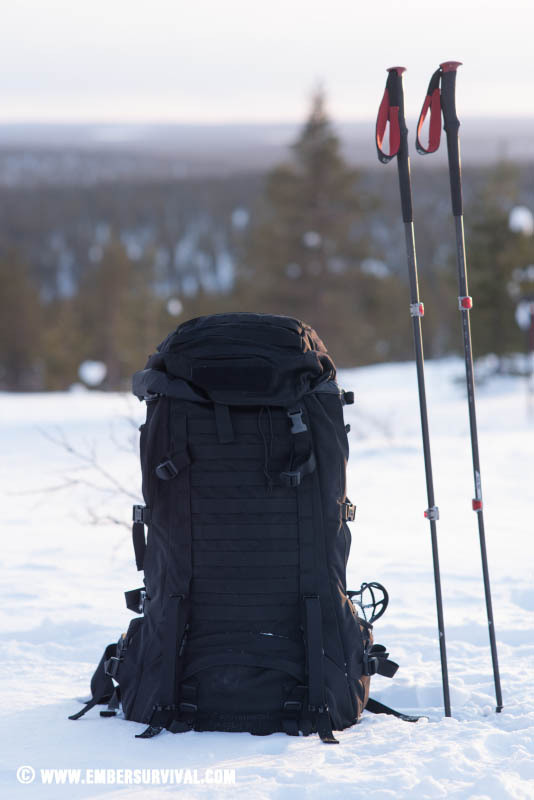 Overall the Predator 80-130 is great long distance, heavy load carrying pack which is built to last. Highly Recommended. More information HERE. Read our review on the Karrimor SF Sabre 60-100 HERE.